Will America's Short-Term Memory Loss Kill the Climate Bill? Where are the Swing Voters on the Climate Bill? ENERGY: It's a problem that never goes away (despite our best efforts as a nation to ignore it). Why has there been so much talk and so little action? In Who Turned Out the Lights? Scott Bittle and Jean Johnson offer a much-needed reality check: The "Drill, Baby, Drill" versus "Every Day Is Earth Day" battle is not solving our problems, and the finger-pointing is just holding us up. Sorting through the political posturing and confusing techno-speak, they provide a fair-minded, "let's skip the jargon" explanation of the choices we face. 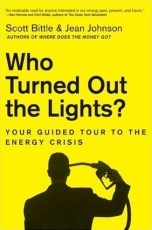 And chapters such as "It's All Right Now (In Fact It's a Gas)" prove that, while the problem is serious, getting a grip on it doesn't have to be. In the end, the authors present options from the right, left, and center but take just one position: The country must change the way it gets and uses energy, and the first step is to understand the choices.